♥ I receive no monetary compensation for this review. I was provided a ShoeClips to try and give my honest opinion. I received the pair of black and white Chiffon Flower ShoeClips $14.00 from ShoeClips HERE .biz to try and review. I have always had a love for accessories, from earrings, necklaces, to jewels on my clothes, ankle bracelets and sparkly shoes. And now we can dress up boring ol' shoes too! 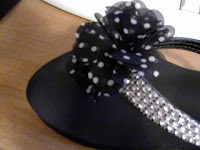 ShoeClips has tons of different shapes, sizes, colors, and prints of ShoeClips to chose from. I dressed up my chunky black sparkly flip flops because I thought my new ShoeClips would look best paired with them, and i was right! doesn't that look so cute?.. I was expected my ShoeClips to be hard plastic but to my surprise my ShoeClips are a super soft material and will go with all of my different colored shoes to give it some needed glam. To my surprise the ShoeClips are a lot easier to use then i thought they would be! 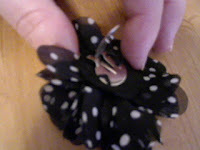 as you can see in the picture there is a gator clip that you open slide the ShoeClip over the shoe where you want to glam it up and snap it shut. The ShoeClip won't slip off because there are 2 teeth that snap shut when you close the clip. you can wear ShoeClip anywhere on your shoes and even shoes! 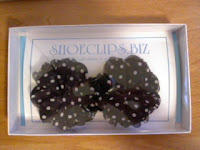 ShoeClips would make a great gift for any woman in your life no matter what the age.